Halloween is just a few weeks away, and while we're still trying to decide if we're going to be a unicorn or a Snapchat filter, some towns across the U.S. have already gotten the party started. Each of these spots has its own special way of celebrating the holiday, with family fun activities to downright terrifyingly haunted experiences. Calling all ghosts, goons and ghouls: If you take Halloween super seriously, consider spending October 31 in one of these towns. When it comes to the perfect location for a family-friendly Halloween, no one does it better than Chandler, AZ. 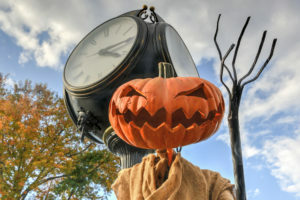 The town's yearly Spooktacular Festival invites kids of all ages to participate. From the witch broom races to the huge costume competition, there's something for everyone. Don't forget to stop by the spooky haunted house ... if you dare. When the weather cools down, Long Grove, IL turns into a beautiful fall festival. The town is already cute on its own, but during October the local shops show off their Halloween spirit by displaying windows full of Halloween decor while others offer specially decorated confectionaries. Long Grove also has it's yearly Ghost Walk where families are taken on a tour to meet some "ghosts" and hear their stories of the town's history. Harbor Springs, MI might appear to be your typical small town, but it takes Halloween activities to the next level. Led by the local high school marching band, the Halloween parade draws crowds of costume wearing goons. Instead of the typical door-to-door trick-or-treating, Harbor Springs also does trunk or treating — where locals decorate the backs of their cars to hand out candy. In Anoka, MN, aka the Halloween capital of the world, celebration don't just happen on the 31st — but the entire month of October. Fill your stomachs to the rim with the great pumpkin bake-off competition or enter the town's house decorating contest — which might inspire you to enter the Gray Ghost 5K Run! The yearly tradition honors marathon runner, Bill Andberg, who people use to see running through the local cemetery dressed in all gray. We couldn't do a roundup of Halloween towns without paying homage to the most haunted city in America. From the fortune tellers to the voodoo, NOLA is eery enough year-round — but it manages to crank it up for Halloween. Enjoy some tunes at the annual Voodoo Music + Art Experience Music Festival or keep it a bit more simple with the NOLA Halloween pub crawl. If you can make it to town a little before Halloween, Oct. 22 is the Krewe of Boo parade. Imagine Mardi Gras-style floats, beads, and parties with a spooky feel! While the weather might not feel crisp, the ghost around the docked Queen Mary will send a shiver up your spine. Long Beach knows how to celebrate Halloween and uses the haunted to ship to scare visitors with it's rumored 150 ghosts — and with the help of its haunted houses and events! The haunted maze is a must although we'll warn, it's not for the faint at heart. The tales of the headless horseman are spread all around this town — and locals love it. They bring out wagons and figures and really turn the place into a scene from a scary movie. Now if you want to see something extra Hallow-weenie, The Great Jack O'Lantern Blaze is a must. Over 7,000 pumpkins are carved and put on display for pumpkin peepers to awe at.